To paraphrase recent Fletcher grad and former student blogger Mariya, the Fletcher community is everywhere. Every so often, some members of our community turn out to have a pre-Fletcher history, and this year brings us a particularly unique instance of a longstanding friendship continuing into the academic year. 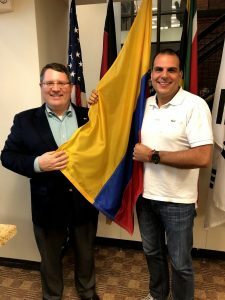 Long before earning his PhD at Fletcher and returning to join the faculty, Rockford Weitz – Professor of Practice, Entrepreneur Coach, and Director of the Fletcher Maritime Studies Program – hosted Colombian exchange student Luis at his house in Moscow, Idaho. 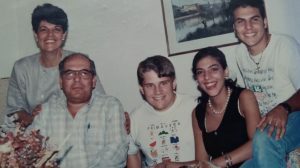 They later reversed roles, with Luis hosting American exchange student Rocky at his home in Cali, Colombia. Luis went on to work in a variety of roles in post-conflict rural development and sustainable agriculture, and served as a valuable resource for Rocky’s law school thesis on Colombian peace-building organizations. You can see where this is going. We’re all excited to welcome Luis to Fletcher as a mid-career MA student this fall, but perhaps no one more so than Prof. Rocky Weitz. Each has a full agenda as the academic year begins; Rocky with a variety of teaching and advising responsibilities, Luis with starting classes and getting settled with his family in Medford. These old pals have found time to get together amidst all the hubbub, and have even begun discussing an idea for a sustainable agriculture startup. We’ll be sure to keep an eye on how their paths continue to intersect at Fletcher and beyond!